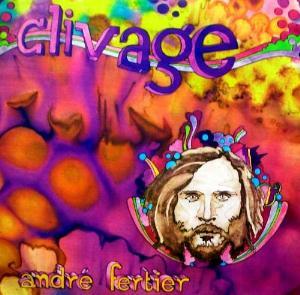 Andre Fertier's Clivage, for those who want some eastern oriented music! I have just reviewed an album by Futuro Antico, and the name of Clivage came to my mind immediately, the music between both projects is not that alike, but in a way i consider both have a similar style in some moments. Clivage is just another one of the endless great recommendations of my friend Assaf Vestin, who is simply a connossieur and expert of the progressive rock realm, no matter the sub genre, he has always something accurate to suggest. So i took his suggestion and i couldn't be happier. Clivage's is the project by a french composer called Andre Fertier, who gathered some of his musicians friends and created 3 (if i'm not wrong) worthy albums that have an outstanding mix of eastern music and a touch of jazz, in a general view, the label of raga-indo prog fits perfectly with this kind of music and despite my lack knowledge of what raga music is, so far this is one of the best albums i have listened of that genre. The album called Regina Astris features only 4 songs, the first 3 are long ones with an over 10 minutes lenght while the last one is shorter, the total time of the album almost reaches 40 minutes. An instrumental album that will give you an exciting fusion of sounds. It opens with Moving Waves which is a marvelous opener song, since the first moments it leads you to the eastern sound and the fusion of styles, as i previously said. You will listen to perfect arrangements and a well crafted composition, the nature of the music created is very exciting, while first you are listening to some guitars with a sitar resemblance, then you will be caught by a fabolous saxophone sound which in my experience is not that used in the indo-raga music (i repeat, in my short experience with the genre), that particular flavour is what made me love this song since the very first listen. The next one is the title-track and opens with a delicate violin sound and a soft atmosphere created by some keyboards that also gives to the song a folkish flavour due to the percussion and the later guitar sound that reminds me to the softest Shakti with Mahavishnu style, by the way, with a one minute difference this si the longest track of the album. The first third of it is very calm and soft, while suddenly it turns into a little bit more challenging one with the splendid violin and some kind of claps along with a delicate bass playing, and in the last third of the song we will listen to a more intense sound with some great percussions and again the exquisite sax sound at the end of it, a song that definitely defines what indo/raga prog is, i believe. Mama Swat opens with some moment of tension, here and there you will listen to the violin and bass, while the tabla is what predominates here with it's non-stop sound, then until minute 3:30 the flute and keyboards appear and the song begins to make it's progression, while in the beginning you may think it is just floating, then it turns into a solid musical piece where each instrument play an interesting and main role, giving to the song a terific sound. Anf to end, we have Tabarkha, which is the shortest song and which has a constant rythm where the violin part it's repeated over and over, as well as the other songs this of course has that eastern flavour and indian roots. An excellent album, for those like me who don't really know the indo/raga prog genre, this is an excellent album to start exploring the realms of this music. 4 stars, highly recommendable!